NOTE: You will be automatically redirected in 10 seconds to my new blog. 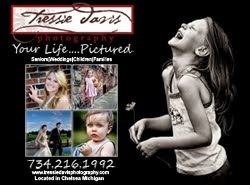 I'm retiring the Tressie Davis Photography blog. It will remain out here in cyber-land as long as google sees fit for a dormant blog, but I will no longer be updating. Be sure to catch me at my new creative venture Project Faces and Places (yay!). For clients, session sneak peeks will continue to go on Facebook (like my page! TDP on Facebook). If Twitter is your thing, join me there VSPRINK.